1. Edinburgh Castle from the Vennel. I went out one evening just before Christmas to try some long exposures around Edinburgh. The Castle is a substantial building which dominates the skyline at the West End of Princes’ St. 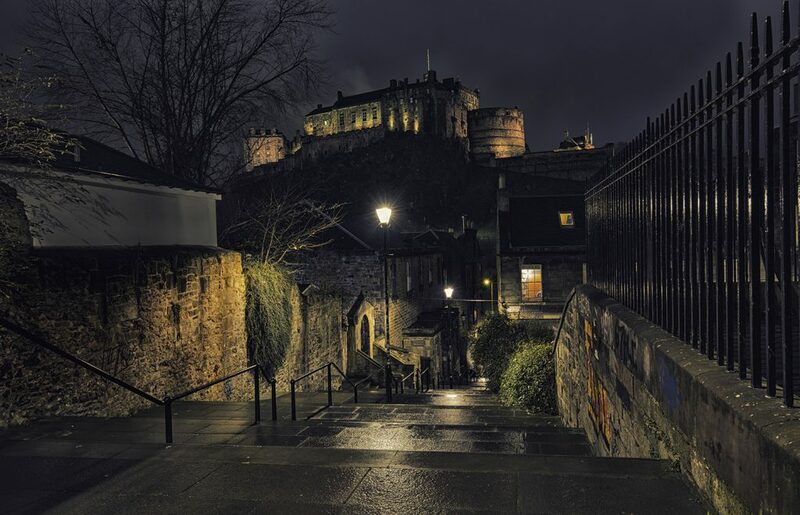 The Vennel is a steep stairway which rises up from the Grassmarket and is challenging when carrying an SLR camera and tripod. I rather liked the tungsten glow of the street lighting and the clear lines leading into the picture. 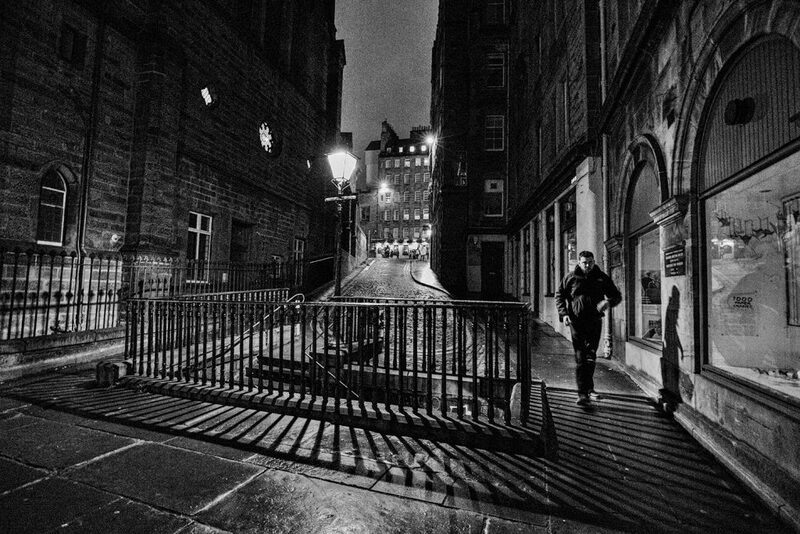 I lived in Edinburgh for a couple of years in the 70s and enjoyed walking there on winter evenings. The Old Town, I always found most interesting with its haughty and varied architecture . On the evening in question, this part of town was more busy than the picture suggests as there are some attractive restaurants and bars in the area and it was office party time. A conversion to black and white, I thought appropriate suited the subject. Oct 5th Anniversary found me in Ireland and the chance to photograph this young woman at Grianan Aileach. 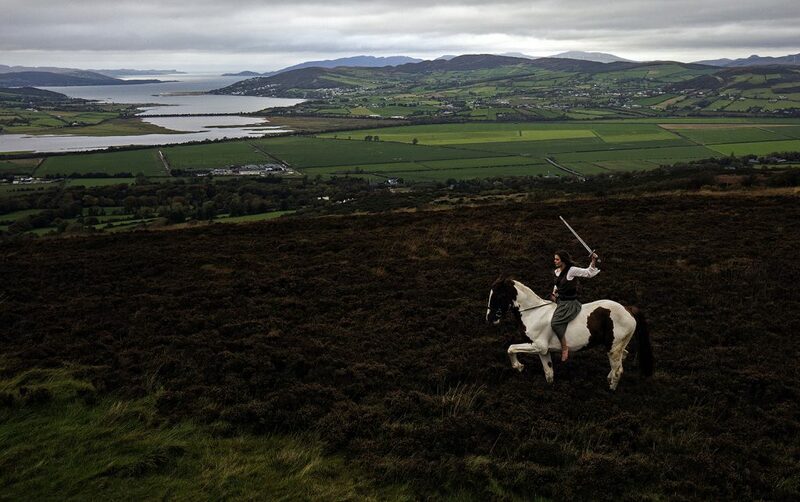 It was a rather dull day for landscape photography (bright cloud overhead is my preference) but I thought the scale of the image with the young rider in the foreground to the distant Lough beyond Swilly was worth capturing with all the little homesteads dotted around the hillside. All of the images were taken on a Canon 5diii with a Canon EF 16-55mm lens.